Are you looking to expand your business to Indonesia market? 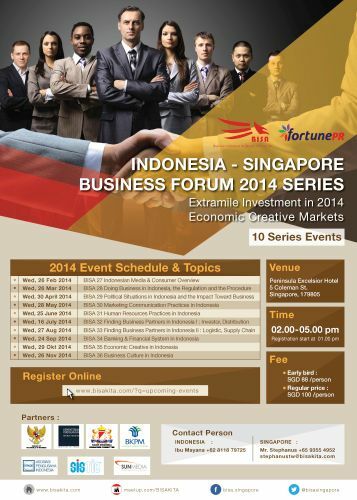 Come and join us to the monthly networking event, Indonesia-Singapore Business Forum (ISBF) Series 2014. Started on Feb 2014, BISA (Business Indonesia Singapore Association) and Fortune PR (www.fortunepr.com) formed its partnership to build a bridge and help Indonesian/Singapore SMEs Business owners to expand, share, learn and network to Indonesia and Singapore market. We support the prospectus of economy in both markets by increasing the business opportunity for business owners whom wants to tap on these potential booming markets. The programmes of Business Forum for SMEs are supported by Indonesia/Singapore Embassy to encourage Indonesian/Singaporean Business owners to mingle and share their business experiences. Besides, there are aspects of learning on the Business culture and Business opportunities for Indonesia/Singapore market. The prestigious speakers from Indonesia/Singapore government sectors are invited to share their expertise about the business opportunities in the both markets. This event will be attended 40-50 SMEs from Singapore/Indonesia every month. The next event would be on 28 May 2014 with the topic: "Communication Practice in Indonesia". This topic will help you to understand better on how to enter and market your product into Indonesia.